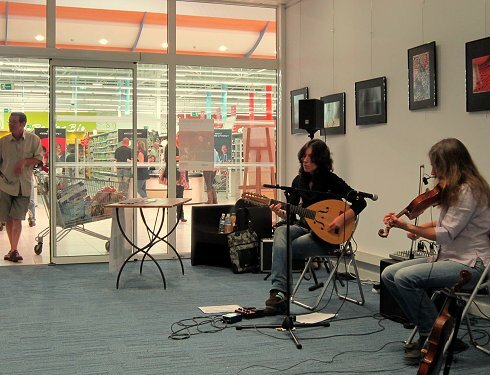 Friday evening live music from Hélène Brunet and Nicola Hayes in the Leclerc hypermarket at Pontivy, Brittany . Their latest Cajun, Irish and Appalachian flavoured album is titled Travelling. Which is appropriate because that is what I am still doing. More music outside the comfort zone here. Lute (?) player is using right hand on finger board. Is that standard? Why do violinists use left hand on finger board? Is bow control more sensitive than fingers on the strings? I think that is not the standard setting of the lute. I think the lute player is left-handed.